Female transmits disease to all the offsprings (both males and females). Male doesn’t transmit the disease and only the females transmit the disease. If Mitochondrial inheritance is absent, go to second step. Atleast one member in all generations will have the disease. Both affected parents can produce normal offsprings. Parents must be heterozygous. There will be some generations without the disease also (skips generation). Both normal parents can produce affected offsprings. In such case, parents must be heterozygous. Male transmits disease only to the daughters (all daughters). Female transmits disease to half of sons and half of daughters. If only males are affected, it is likely to be X-linked recessive. Female only acts as carriers and remain unaffected. Affected individual transmits disease to 1/2 of offsprings. Affected individual transmits disease to 1/4 of offsprings. 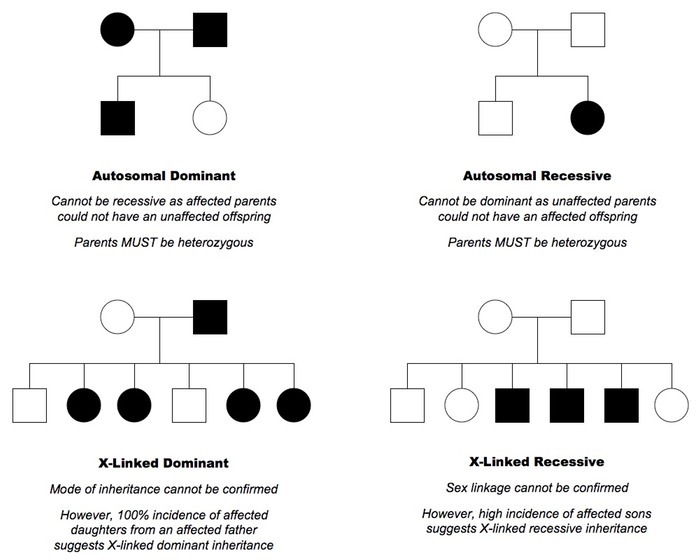 Consanguinity increases risk of autosomal recessive disorders. Only males are affected (father transmits the disease to son). 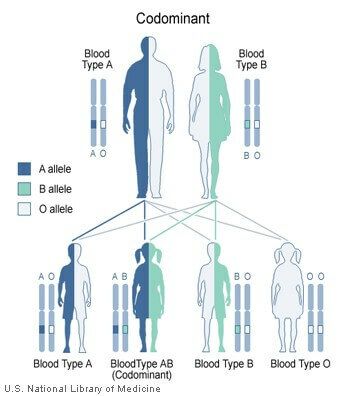 This is similar to autosomal dominant inheritance but in codominant inheritance, two different versions (alleles) of a gene can be expressed, and each version makes a slightly different protein. e.g. Blood group, HLA.